You have an unwed mother-to-be. You have a Hispanic family. For once, the two are not one and the same. That happens to be one of the pluses to Bella, a small film both in budget and length that tells a simple story well, though not as strongly as it could have. Jose (Eduardo Verastegui) was a soccer phenom. I say 'was' because on his way to sign the contract for a major league club, there is a tragedy (which we see later). This tragedy, and the aftereffects, so shattered him that he is now working as the main chef in his brother Manny's (Manny Perez) restaurant. Even after all this time, Jose is still a wreck, and you can tell by the fact he has ample amounts of hair and an overgrowth of beard, making him look even more disheveled and almost unhinged. Among the people working at the restaurant is Nina (Emmy-winner Tammy Blanchard), all decked out in her Frida Kahlo-influenced uniform. She's been late twice already, and this third time is the last straw for Manny: he fires her. There's something about Nina's predicament that piques Jose's interest, and he basically abandons his job to hand Nina her bear which she dropped. It's then that he learns what we already know: Nina's pregnant. For the rest of the day, the two travel through New York and the outlying areas, where we discover Jose's secret (which is in a roundabout way related to her situation), see his family and its dynamic, and come full circle at the end. Bella has this as its major flaw: bouncing back and forth between past and present (even maybe the future) without giving us clear indication of when something is taking place or even if it's taking place. There are a couple of moments in Alejandro Monteverde's script (co-written with Patrick Million and Leo Severino) where one isn't quite sure if what we are seeing is real or what a character is imagining or what will or might happen. That kind of bouncing between what appear parallel worlds may work on something like Lost but at times the audience can get lost with all these flashbacks, flash-forwards, and even flash-sideways. That isn't to say there isn't much in Bella to praise. Monteverde (who also directed) got some wonderful performances out of his leads. Blanchard creates this externally tough New Yorker who at the end of this day becomes much more frightened and insecure about what to do with her situation. There is a monologue when she and Verastegui are on the beach where she talks about her parents and the struggles she went through with them that is a wonderful jewel of acting. 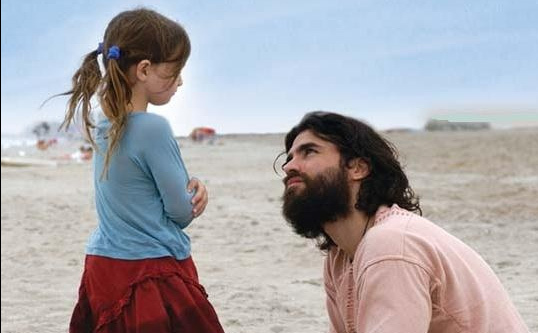 Verastegui for his part created a man extremely wounded by his actions, but oddly all his hair and beard sometimes got in the way of seeing him as nothing more than a slightly crazed man. When he does reveal his secret, we are given a flashback, and when we don't have the distraction of his wild-eyed look we can see a genuine performance. Of course, how can we focus on his acting when he gives us those beautiful, soulful blue eyes staring at us...where was I? Oh, yes, the performances. A particularly strong (albeit small) performance was from Angelica Aragon (no relation, alas) as Jose's mother. She brings a genuine warmth to her performance of a woman who cares about everyone who crosses her path. The best thing about Bella is its portrayal of a Hispanic (in this case, a Mexican/Puerto Rican) family. The family is shown as loving, generally untroubled, and supportive. These generally do not enter the minds of Hollywood features, which tend to show Hispanic families as almost constantly at war with each other (usually involving drugs, gangs, or a mix of the two), and living in poverty. Jose's family, on the contrary, appear almost middle-class, and add to the mix that most of the family speaks English with virtually no difficulty and only the slightest hints of accents. The father (Jaime Tirelli) is the only one in the family who doesn't speak English, but it's understood that this is more his choice and that he understands far more than he is willing to admit. This is more reflective of the reality of a typical Hispanic family where English is as easily spoken as Spanish and which is law-abiding and remarkably close-knit. It's a positive portrayal which I wish were more prevalent in films today. 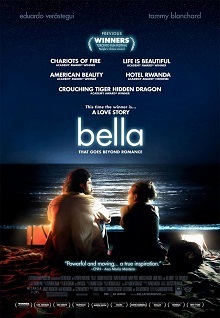 Bella is a small film, gentle, sweet, touching. The problems within Bella (being a bit confusing as to when and if something was actually taking place) aren't enough to bring it down, but they do become distracting. For example, the ending I first thought was a fantasy scene only to discover it was the future...or the present, which would have made the story we had watched the past...as I've said, confusing. Yet in spite of all that, the film is a soft exploration of how tragedies and unexpected changes can alter lives for good or bad, depending on how one takes and ultimately accepts them. It's not perfect, but there is beauty in Bella.